Episode 12 left us at the door steps of the woman who beat up Soo-sun’s mom, with Assemblyman Yoo arriving in a separate car. This week’s episodes opens with Dae-gu asking the woman if she knew where Soo-sun’s mom is. The woman turns out to be Assemblyman Yoo’s daughter, Ae-yeon! Dae-gu is forced to leave the house without getting an answer to his question. Yoo throws a tantrum after seeing the video and the family displays their true nature – the son-in-law is unconcerned and distant, the daughter is spoiled and selfish, and their son seems to be the only sort of normal person in the household. Back at the station, Soo-sun finally gets in touch with her mom and rushes off to meet her. Pan-seok decides to tag along and they arrive at a shabby hotel. Soo-sun enters the hotel room first and sees her mom’s face completely bruised and covered with scars. Her mom says things like “I’m someone worth beaten over” which completely breaks Soon-sun’s heart. Pan-seok comes into the room and the shock on his face is so obvious! Soo-sun’s mom retells what happened at the department story. Apparently after she asked Ae-yeon for forgiveness, she was given an agreement to sign that detailed something about medical fees and what not. She agreed to it without getting a full explanation because she did not want to pay for the bag repair. Right after she stamped her fingerprint onto the agreement, the rich lady started beating her up with the bag, which was captured on video by one of the two female employees. The mom kept the agreement and gave it to Pan-seok. Then the three of them go to the hospital to get the mom treated. While at the hospital, Soo-sun claims she needs to go use the restroom, but instead she runs off somewhere to cry by herself. At that moment the three musketeers (aka Dae-gu, Tae-il and Gook) appear!!!!! I would have been good with just Dae-gu showing up, but hey, I’ll take anything. The three of them watch her cry for a bit and then all leave to give her some space and time. this could also be an album shot or something. The next day Dae-gu goes to the hospital first to visit the mom and Soo-sun. Mom already knows he is Ji-yong from Soo-sun and launches into this whole speech about how she never felt like he was a stranger. She even proceeds to ask him to call her mom! He does, and hands her the flowers he was hiding behind his back. Mom’s face brightens up immediately. Just then Gook and Tae-il arrive, both call her mom (awww, but darn it, I thought it was a special Dae-gu privilege!). Mom eating the porridge Tae-il made even though it hurts to eat. The four of them go out to eat and Soo-sun starts to spoon scallion into Dae-gu’s bowl. Dae-gu begins to stop her, and she asks if he does not like scallion. Instead of saying the truth, Dae-gu says he likes it and spoons some more. 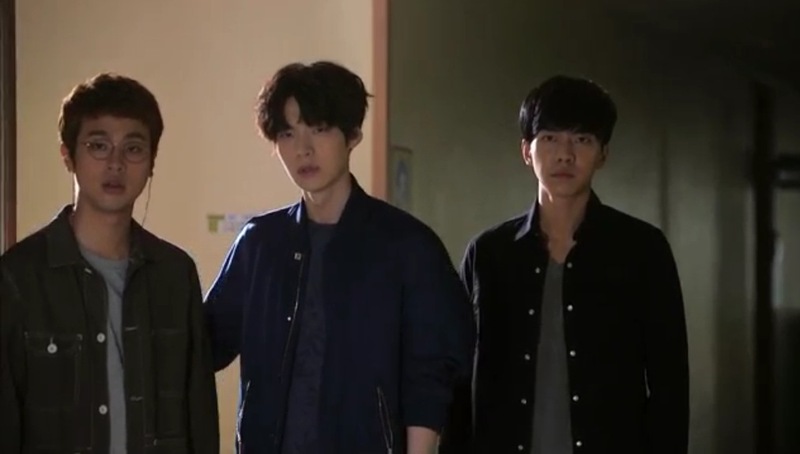 Both Gook and Tae-il look on in shock, because how can picky Dae-gu change so suddenly? It must be L-O-V-E! Pan-seok and Dae-gu go to the rich lady’s house again to try to meet with her. She arrives in a car and blatantly ignores both of them. She then tells her secretary to look into the two, especially Dae-gu because “he strangely gets on my nerve.” Yikes. Pan-seok gets called in by the section director (aka Toad). Toad tells him to call off the case because Assemblyman Yoo is involved and they don’t want blemish on Yoo since he used to be a police commissioner. Pan-seok goes off saying if they want the case closed they need to show up and get it resolved as soon as possible. Ha! Poor Toad, no one listens to him. Toad then goes to Chief Kang to complain about the situation, and compares team 3 to a makjang drama. Ahjussi, are you prophesying just now? Chief Kang receives a phone call from Assemblyman Yoo who is upset that Dae-gu is in the middle of all this. He threatens to take care of Dae-gu himself if this continues. Chief Kang is super angry and says “it’s always Yoo Ae Yeon who’s causing all the problems.” Eh? Perhaps Ae-yeon is the problem causer years ago as well? 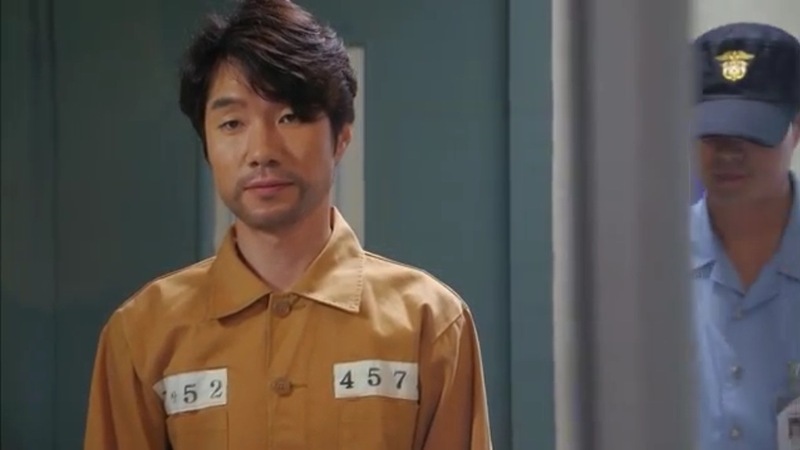 In the next scene, Pan-seok visits Hyung-chul in prison. To be honest, after getting all caught up with the designer bag story line, I have forgotten about Hyung-chul for a while there! Good thing the story brought him back. Anyway, Pan-seok presses for more information about the Masan nurse case, but Hyung-chul says not to dig into it anymore or else Dee-gu will be in more danger. Hyung-chul ends the visit and tells Pan-seok to not come again because he will decline the visit like he declined Dae-gu’s the day before. Pan-seok tells Hyung-chul “I’m sorry and thank you” for what happened years ago, and promises to bring delicious food on his next visit. Dae-gu and Pan-seok are on a stakeout together. It is extremely hot, but Dae-gu refuses to turn on the ignition and AC. Pan-seok offers him food and soda, but Dae-gu declines in his normal stubborn way, although in the next scene he is munching on the food and drinking the soda like it’s nobody’s business. Pan-seok requests the AC again, and Dae-gu finally agrees. They launch into a conversation about visiting Hyung-chul, but neither tells why they went to see Hyung-chul. Just as the scene was getting cute, a lawyer approaches them; he says he represents Ae-yeon. The lawyer tells Dae-gu and Pan-seok to stop investigating or else he will file for defamation. Dae-gu tries to argue that the agreement was missing a clause about punishment by law and it was signed under coercion before the beating. The lawyer fires back and claims that the monetary amount in the agreement was enough to cover the legal grounds and it was signed post beating. The lawyer even goes on to say they have a witness who saw the whole thing. Dae-gu and Gook track down Jin-kyung, the person who uploaded the video. However, Jin-kyung does not cooperate and claims that all she wanted to do was to humilate Ae-yeon, not to cause so much trouble. I bet Dae-gu knows how Pan-seok felt years ago when he was trying to persuade Dae-gu’s mom to stand trial as a witness. That night, Chief Kang goes to Soo-sun to request that she gives up on the case because Ae-yeon is Assemblyman Yoo’s daughter, AND that if she continues people around her will get hurt. When Soo-sun returns the hospital, Dae-gu is there showing mom a magic trick (and failing). He makes her a necklace and the mom just lights up. Dae-gu and Soo-sun goes on a night walk and they share a heart to heart talk. Soo-sun wonders how he endured all these years when she can’t even endure two days of seeing her mom like that. Dae-gu says he didn’t endure it, he just dealt with it because sooner or later it has to be dealt with. Soo-sun chides that he is just like an oppa when he talks like that (awww). Dae-gu then gives her an ipod that he listens to feel better. He insists that she REALLY will listen to it. Omo, what is it??? A confession??? Nawh, it is not. She listens to it after Dae-gu leaves and it is a beautiful song that pretty much reflects what Dae-gu has been going through, and what she is going through now. Part of song also has lyrics such as “I will always be by your side/You’re precious to me” etc. And all the while she is listening to this, Dae-gu stands not too far away watching her. He holds out his hand as if to comfort her. Tae-il and Sa-kyung meet up at some park, and he spills out his sob story about his dad calling him trash in request for a hug. Sa-kyung agrees and the two ends up in an embrace just as Pan-seok walks by (of course!). At first Pan-seok encourages Tae-il to continue hugging the girl as he quiet slips by, but then he saw Sa-kyung’s face and gets crushed. He starts to walk away, but Sa-kyung runs up to him and demands to know why he signed the divorce papers. What? The plot is definitely thickening, and I can sense it all coming out now! So excited for the next episode. Stay tuned for a recap on that as well!